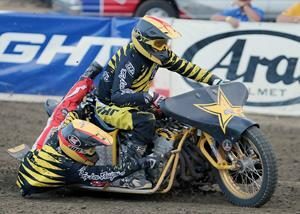 The Extreme Sidecars, on their second season appearance at Fast Fridays, were greeted by a near capacity crowd in the Gold Country Fairgrounds. Always welcome by Fast Fridays fans the sidecars treated the full house a great show of three wheeled racing excitement. 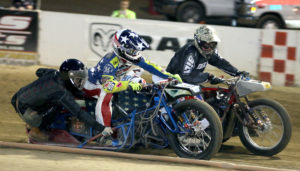 The sidecar team of Joe Jones and Chuck Heider took the main event, but the team of Smiley Kinne and Jeff Powell gave them a real challenge and the racing exciting including a crash into the start- line haybales. Robert Curry and Sammy Tetrault were third and the team of Bryan Motis and Eric Hernandez, who won two of the three heat races, finished fourth. Tetrault who would usually find himself throwing his leg over a speedway bike spent the night also riding on the back of a sidecar doing a great job as Curry’s wingman. Chance Grove won the handicap main event, his first division one main event of the season. 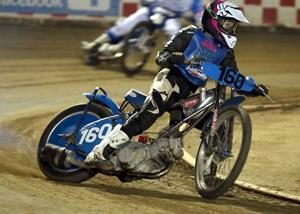 Grove, a relative new comer to speedway starting just late last season has worked his way up to division one quickly and proved he belongs with the win. Louie Mersaroli was second and Tyler Warren was third. Aaron Sorani was first in the Division II main event. It was his second main event win of the season. Sammy Tetrault was second and Charlie Haines was third. A dramatic win highlighted the division three main event for Auburn’s Dakota VanderBroeder. 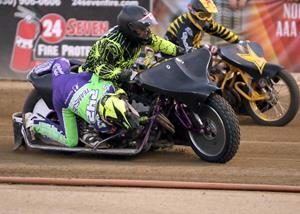 VanderBroeder took a serious fall in turn three which stopped racing for a few long minutes while emergency personnel attended to her. Injuring her leg, she was helped into the infield then was walking on her own power. Referee Steve Lucero signaled she could still make the restart if she beat the two minute timer. VanderBroeder hustled with her gear to make the restart. From the back of the pack she worked her to the front taking the win with the fans cheering loudly, clearly on her side. Casey Cornilsen was second, Peter Pecorilla was third. “I thought I might have broken my leg and couldn’t ride but I started moving it and everyone helped me,” said VanderBroeder. 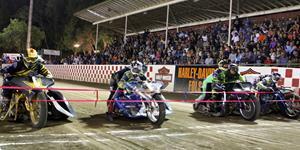 Auburn’s Cameron Krezman won his third Youth 250cc main event Friday night. Landon Norton was second and Greg Moore was third. 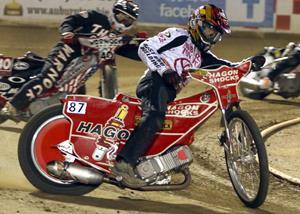 Dylan Wagner won the 250cc consolation main event. Enzo Sorani was second and Alex Martin was third. 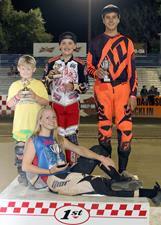 Again eleven year old Charlie Trana won the Youth 150cc main event. Handicapped on the 40 yard line the young Trana just keeps winning. 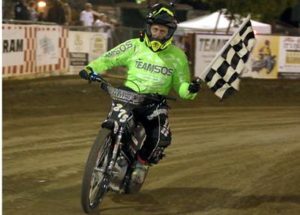 The win marked his third Youth 150cc main event of the season. Up from Southern California Travis Horn was second. Nick Hohlbein was third. Auburn’s Bart Bast has won the scratch main event two weeks in a row. 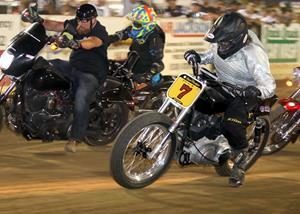 Bast and Billy Janniro are the only two riders to win the scratch main event this season at Fast Fridays. Improving every week Chance Grove won the handicap main event. 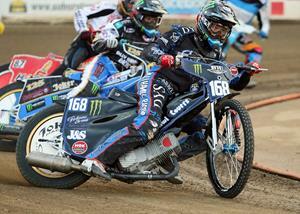 Grove just began speedway racing late last season. Fan favorite and Auburn resident Dakota VanderBroeder won the Division III main event. VanderBroeder fell hard, walked it off, restarted and won the main. 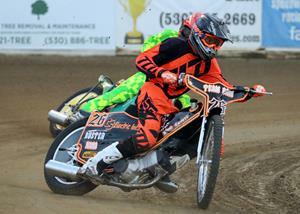 Cameron Krezman won his third Youth 250cc main event Friday night. Friday night winners (left-right) Royce Howard-Pee-Wees, Charlie Trana-Youth 150cc, Cameron Krezman-Youth 250cc and sitting Division III winner Dakota VanderBroeder. The popular Extreme Sidecars made their second of four appearances at Fast Fridays. Joe Jones and Chuck Heider won the main event. Sammy Tetrault gets the hang of riding on a sidecar on the back of Robert Curry’s sidecar. 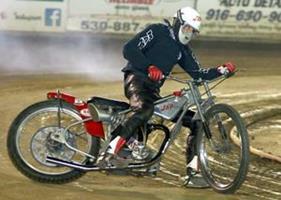 Tetrault rides a speedway bike in Division II along with his side hack duties.